Founded by the French more than three-hundred years ago, ceded to the British after the French and Indian War, and eventually surrendered to the United States after the American Revolution, Detroit is having a restart moment: it’s changing, it’s exciting and it’s a little over half-a-day’s drive from Chicago. Though still synonymous with automobiles, the Motor City—Motown, The Arsenal of Democracy and even, ugh, Murder Town—is now becoming less known for being one giant assembly line and more known for being something of a frontier where the limits of the possible are still being defined. Detroit is now where the adventurous can stake a claim for not a lot of money and, who knows, maybe ride the crest of the city’s hoped-for reawakening. Make no mistake, though: vast stretches of Detroit remain busted up, burned out, forbidding and perhaps unredeemable. However, because Detroit was beaten down so hard by the precipitous decline in the auto industry and other socio-economic factors, as well as abandonment by large numbers of former residents, it now has considerable potential for growth. 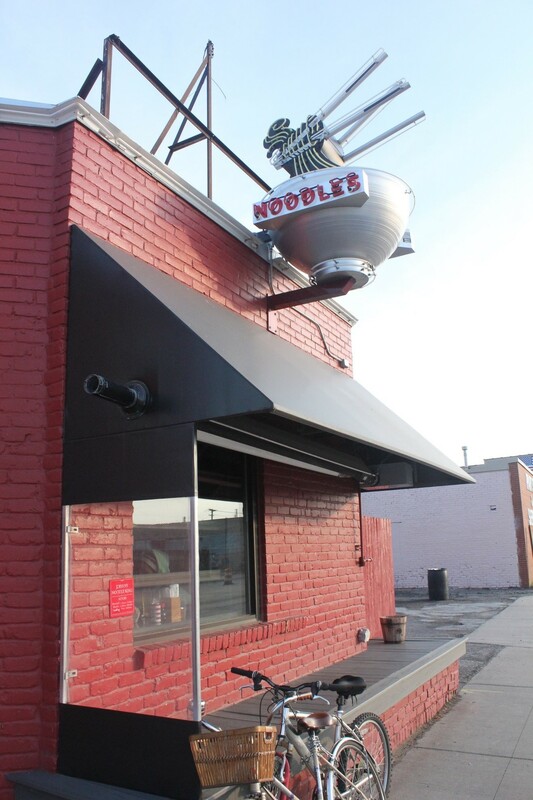 One rapidly growing area in this centuries-old city is Corktown, Detroit’s oldest neighborhood, founded in the mid-nineteenth century by Irish families fleeing the Potato Famine. Later, the neighborhood took in a number of German and Maltese immigrants. Until 2009, ten years after its baseball team left for a new home nearby, Corktown was the home of Tiger Stadium, now an empty field but soon to become a large public park of many baseball diamonds. Corktown is also home to a number of new restaurants, like Gold Cash Gold, and emerging beverage makers, like Two James Spirits. These food/bev start-ups powerfully reflect the way the new city is building upon the crumbling, though salvageable, remains of the old. Gold Cash Gold is an intriguingly named new restaurant that reflects the spirit of reinvention that many hope becomes emblematic of the Motor City resurrected. 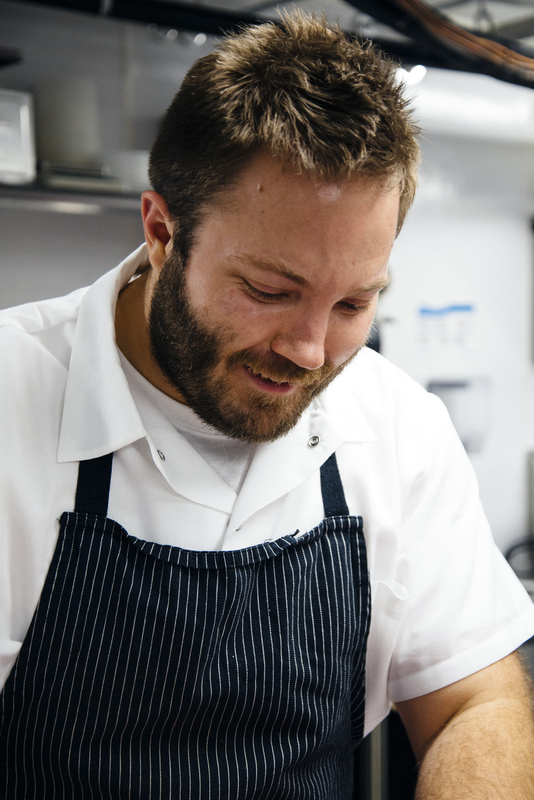 Located in an old pawn shop (thus the name), Gold Cash Gold is headed up by chef/partner Josh Stockton, who’s happy to be in a place with abundant older and reasonably priced structures, sturdy old buildings that can accommodate bright new ventures. That sense of history is key, and the new wave of Detroiters like Stockton see it as an advantage to grow a business upon the remains of what used to be one of the fastest-growing and most vibrant cities in the world. Detroit is looking ahead though the past is always there, all around. Leveraging the remnants of that past is a way to move ahead while honoring what came before. The renewed sense of future possibility drives people like Stockton, gives them the energy to push forward… and license to try new things, experiment, see what works. 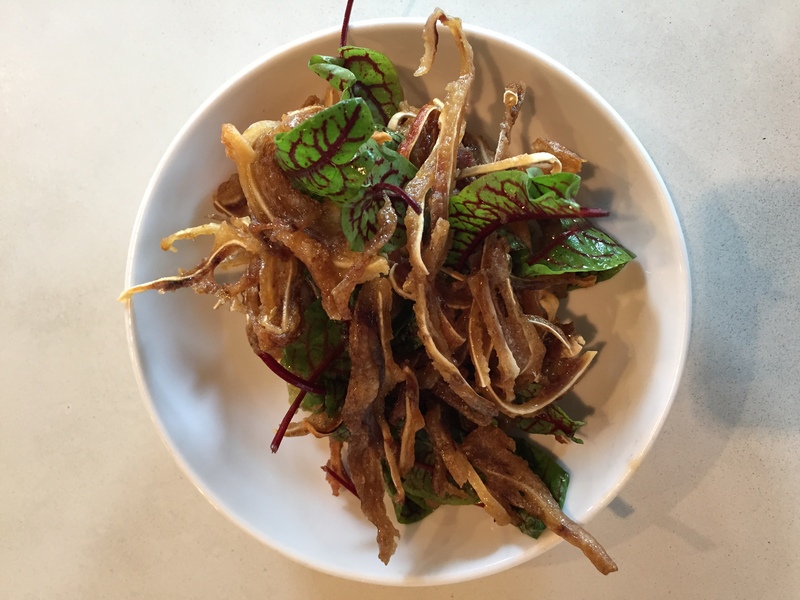 Stockton takes some risks with his menu, offering dishes like Crispy Pig Ears and the deliciously alliterative Pig’s Head Pierogis, both reflecting the city’s powerful Polish tradition and the so-old-it’s-new trend of using whole animals, head-to-tail. Stockton explained to us that he first boils the ears, confits them in lard and then fries them: the results are deliciously crisp and lush strands that stand up as a side or as an accompaniment to drinks. The pierogis are also fried crisp, dense and meaty, and a beautiful example, like the restaurant itself, of how new Detroiters are using everything they can while throwing away nothing they might use. Stockton sources from farms outside the city, but Gold Cash Gold also has its own farm in the city, part of a larger initiative to turn what so recently became an urban wasteland into an agricultural resource for the city, the region, and who knows, maybe the world. 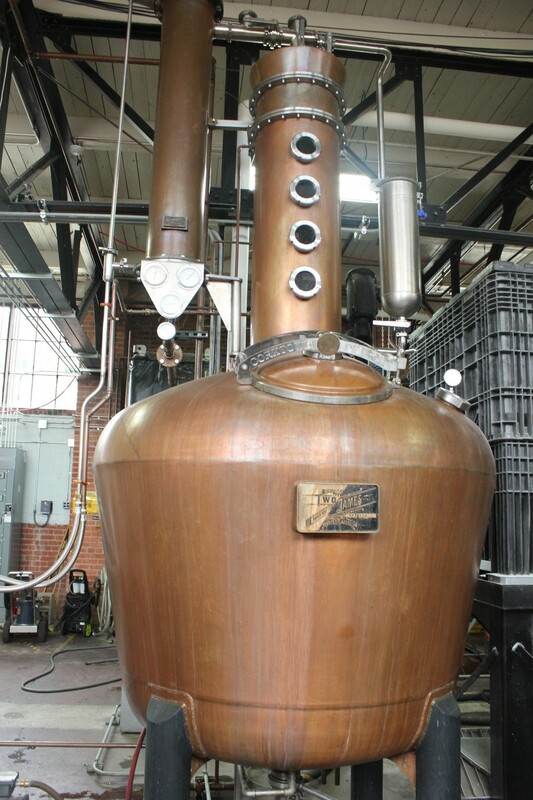 As at Gold Cash Gold, Mohr and his partners at Two James Spirits have established themselves in an old structure that provides a sprawling environment that generously accommodates the metalwork and other massive machinery required by a distillery. 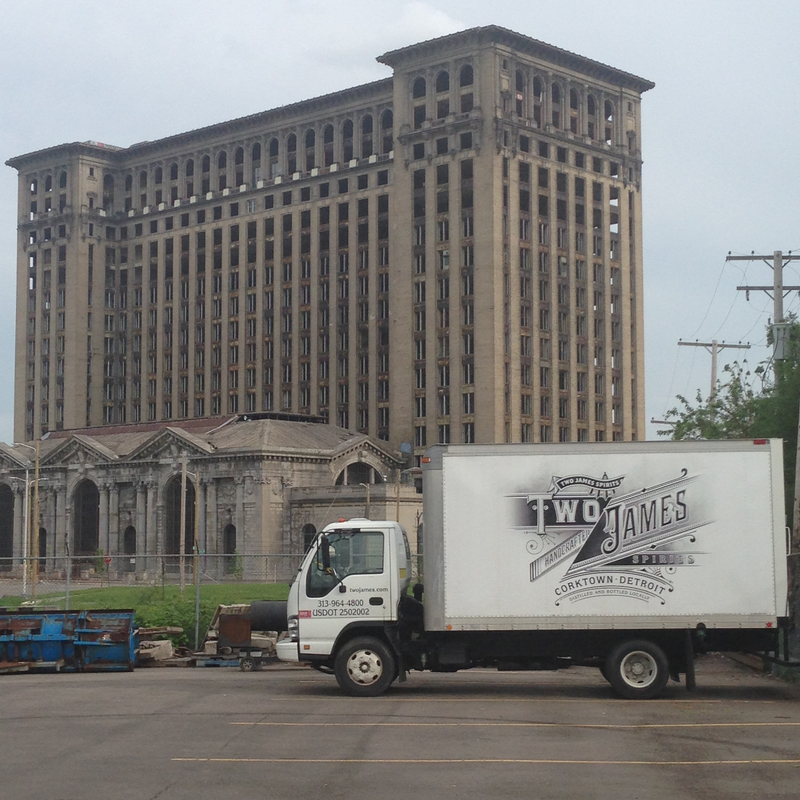 Located in an old taxicab storage/dispatch center, Two James is the first licensed distillery in Detroit since Prohibition. 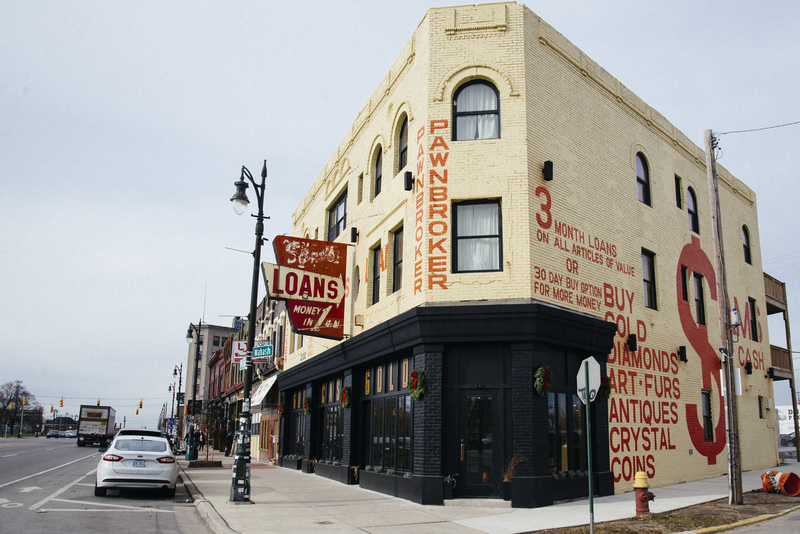 Beyond the economic advantages of retrofitting old buildings for new business, people at places like Gold Cash Gold and Two James—and hundreds of others throughout the new Detroit—honor the past as they create a new future. That past encompasses the buildings of Detroit as well as the traditional farm culture of the state. 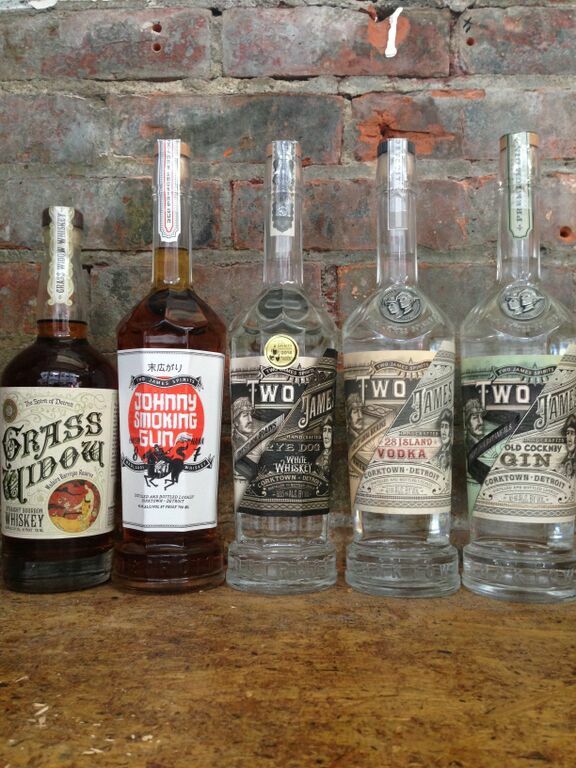 Two James is currently producing a number of distilled beverages, several available in Chicago area Binny’s outlets. Old Cockney Gin is a contemporary take on a classic spirit, with mandatory (though dialed down) juniper as well as citrus high notes from orange peel and earthier bass lines delivered by roots of orris, angelica and gentian, accompanied by a spiciness from coriander and whole black peppercorn. So much commodity gin is tasteless, with little more character than vodka; Two James gin is complex enough to drink solo, on ice. Grass Widow Bourbon is made from a mash bill that contains more than thirty percent rye but mostly corn, as required by regulations that specify how “bourbon” is to be made. Aging in Madeira barrels gives this bourbon a wine-like sweetness that plays well against the smokiness from the charred American oak barrels (also required for all bourbons). The “Grass Widow” name comes from a much older Detroit distillery that flourished before Prohibition and then disappeared. Michigan was the first state to repeal the Volstead Act, but it’s taken until now for Detroit to open another distillery. Johnny Smoking Gun Whiskey is eighty-seven proof—eight and seven being lucky numbers in Japanese culture. The Japanese characters for “Prosper” are inscribed on the bottle’s label. 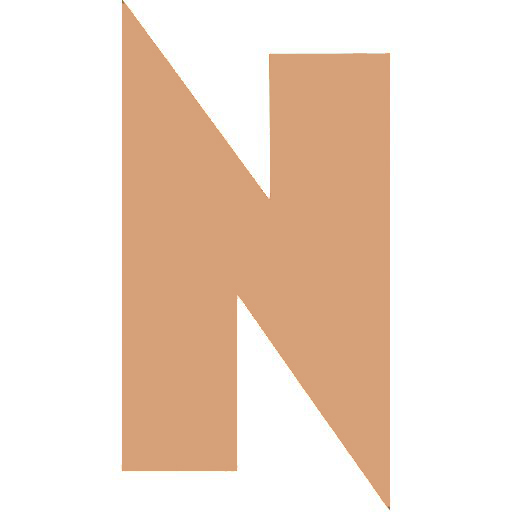 That optimism, and the hope for a little luck, on a bottle made by a Corktown distiller for another Corktown restaurant, reflects the shared enthusiasm of a new cadre of business people. These bold spirits are helping each other and helping Detroit reestablish itself as a new kind of urban center, leveraging the past, but unconstrained by that past, making something new that builds upon and beyond the Detroit that grew to prominence powered by the internal combustion engine, and that’s now, right before our eyes, remaking itself.